New Look At Apollo Rocks Finds Evidence Of Moon's Birth : The Two-Way An examination of rocks collected by Apollo astronauts shows a peculiar type of oxygen indicating a massive collision between Earth and another object 4.5 billion years ago that formed the moon. An Apollo 12 astronaut makes footprints on the surface of the moon, Nov. 19, 1969. Rocks collected on the mission were among those recently re-examined by a team of German astronauts. A new analysis of rocks collected by Apollo astronauts on the moon more than 40 years ago bolsters the leading theory of our natural satellite's origin — that it formed from a collision between a nascent Earth and another object some 4.5 billion years ago. The theory, first suggested by William Hartmann and Donald Davis in 1975, goes like this: The early solar system was a lot like a demolition derby, with big chunks of rocky material careening through space and frequently colliding with one another. One of those wayward objects, a planet-sized chunk of material scientists call Theia, slammed into young Earth, nearly splitting our world in two. The resulting wreckage was captured by Earth's gravity and coalesced into the moon. The Hartmann-Davis theory has long been the best explanation of the available data, but computer models have predicted that such a collision should have left the moon with 70 percent to 90 percent of its material from Theia, and only 10 percent to 30 percent from Earth. But until now, no one has found any telltale sign of Theia in the moon rocks. 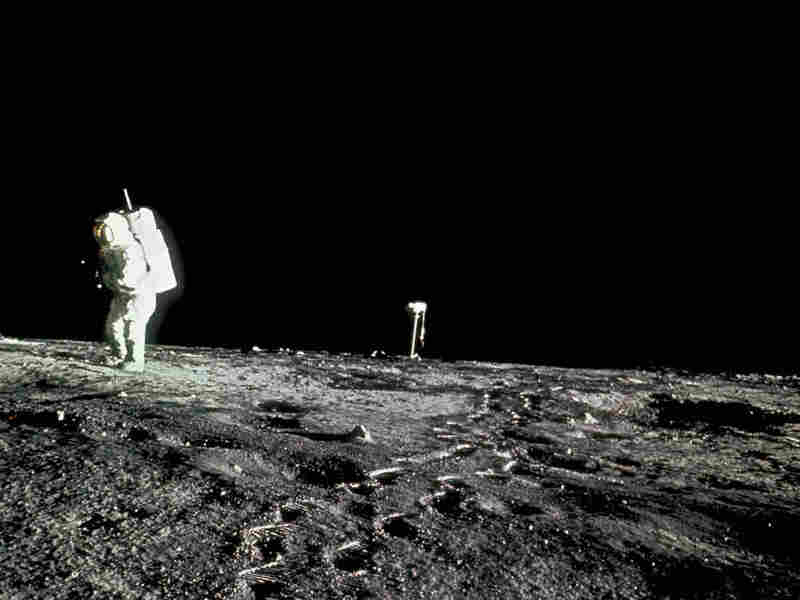 Now German scientists, publishing in the journal Science, say their analysis of rocks brought back by Apollo 11's Neil Armstrong and Buzz Aldrin, as well as the Apollo 12 and Apollo 16 missions, suggests that the moon may be about a 50-50 mix of material from Earth and Theia, whose name comes from the Greek goddess said to be the mother of the moon. "[The] analysis of lunar rock samples from three Apollo missions ... has revealed distinct isotopic differences with terrestrial rock. Scientists believe these differences are remnants of the original [Theia].
" 'The differences are small and difficult to detect, but they are there. This means two things: firstly, we can now be reasonably sure that the giant collision took place. Secondly, it gives us an idea of the geochemistry of Theia,' said Daniel Herwartz of George August University in Gottingen, Germany, lead author of the study." The oxygen isotopes found indicate that unlike Earth, Theia belonged to a class of rare meteorites known as enstatite chondrites that are thought to have formed close to the sun. Herwartz told the BBC that his team's new research puts the last big doubt about the moon-impact theory to rest. "It was getting to the stage where some people were suggesting that the collision had not taken place," he told BBC News. "But we have now discovered small differences between the Earth and the Moon. This confirms the giant impact hypothesis."